And so 2011 slips behind us and into the pages of history. While ahead looms 2012. And it looms ominously I’m sorry to say. Not because of Mayan prophecies or the mutating neutrinos of Roland Emmerich, but because the problems of 2011 – despite seemingly endless summits and photo-ops attended by our political class – have not been solved. In fact, the problems of 2011 were often little more than the ones we failed to address in 2010. As for the problems of 2010? By and large they were unfinished business from 2009. And the problems of 2009? Well, I’m sure you can see the emerging pattern. In South Africa the governments of the world met for a few days and cobbled together a strategy for dealing with Climate Change. In Belgium (and elsewhere) the governments of Europe met for longer periods of time and cobbled together a strategy for dealing with the debt crisis. What unites both strategies is the bizarrely transparent manner in which they fail to achieve their stated aims. I’d always heard that if a job was worth doing, it was worth doing well, but apparently that’s not a philosophy shared by those in power. Had the Durban conference concluded with a joint statement from participants to the effect that they would insist upon compulsory piano lessons for all giraffes, it would have had roughly the same chance of halting Climate Change. Never forget that the reason the big issues facing the world are not being addressed is because the people in charge don’t believe we’re willing to put in the necessary money and effort. And never forget that we put them in charge precisely because that’s what they believe. They promise us easy solutions to problems we know are difficult, and in return we elect them. Even our more manageable problems, such as the European debt crisis, are left to fester until they threaten to visit catastrophic social collapse upon entire nations. And why is this? Well part of it, and this is really quite depressing, is because our political leaders are completely incapable of admitting that they might be wrong about anything. I really do think it’s a psychological disorder. I’m not sure if it’s something they succumb to as a result of a proximity to power, or whether something about politics attracts those who already suffer from the condition. Either way, it is one of the greatest obstacles to progress. The austerity policies in place around Europe are just plain wrong. We have created a society that imposes poverty and suffering on the general population unless it is experiencing economic growth. And at the same time we are implementing policies that are guaranteed to prevent growth. Personally I think we need to restructure society so that it no longer relies on growth, but until we do that, economic policies that prevent growth are nothing less than deliberate, calculated attacks on the citizenry by those in power. The trouble is; even as this becomes clear, even as the failure of austerity slowly sinks in, those in power are pathologically incapable of admitting it. The very fact they supported a policy must mean the policy is the right one. The alternative is unthinkable… that they publicly accept they are fallible. These people should not be running countries, banks or large institutions. They should be heavily medicated, under supervision and kept away from sharp objects let alone the levers of power. They are mid-level bureaucrats of modest ability who have been accidentally elevated to positions of power by a runaway ambition-gland. And it’s broken them; made them delusional. We should not permit them to inflict their delusion on the rest of us. In two weeks time, assuming Europe lasts that long, that delusion will once again be inflicted upon the people of Ireland. In what is the ultimate ongoing demonstration that our government represents the interests of casino-capitalism above that of the citizenry, the next of the Anglo-Irish Bank payments will be made. 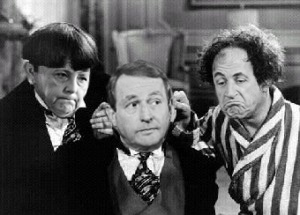 On that day, the Fine Gael / Labour coalition will hand over €1.25 billion of public money to unsecured, unguaranteed bond-holders. It’s mind-blowing really. There is no legal requirement for the government to do this. It is not a condition of the IMF/EU “bail-out”. The payment is not part of the disastrous 2008 Bank Guarantee. Let me repeat; there is no legal requirement to pay this money. Indeed I would argue there is a moral imperative to not pay it. So why are we paying this money, despite there being no requirement? Because our leaders don’t want to upset the markets. Oh, they’re happy to upset the people they were elected to represent. Happy to cut child benefit and disability benefit. Happy to slash the incomes of the already poverty-stricken. But they don’t want to upset the markets. Markets, remember, that Ireland has been effectively excluded from by crippling interest rates (hence our need for the IMF/EU “bail-out”). The markets will screw us alright, but heaven forbid we Irish upset them. To a nation the size of Ireland, a payment of €1.25 billion is massive. It represents more than half the spending cuts made in our recent budget. As a letter to the Irish Times recently put it, “the proposed payment is equivalent to the salaries of 5,000 extra nurses for five years”. But it’s only the tip of the iceberg. 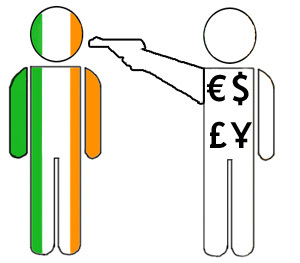 By the end of this year, the Irish people will have paid roughly €2 billion of unsecured, unguaranteed bonds. On top of that, we’ll also be paying more than €3.7 billion of bonds covered by our insane Bank Guarantee. And that’s for Anglo-Irish Bank alone. Yes, that’s right, more than €5.7 billion of public money is being handed over to investors in a single (now defunct) bank in a single year. It’s beyond nonsense and into the realm of criminally insane. We’re constantly being told that we must live within our means, while those doing the preaching are throwing our money away. It’s time we put an end to this idiocy. 2 responses to "One point two five billion euro"
As ever, the concept “our political leaders are completely incapable of admitting that they might be wrong about anything” reminds me of the Right Man (or Violent Male) theory of Colin Wilson and AE van Vogt – elucidated by van Vogt in A Report on the Violent Male & Wilson in A Criminal History of Mankind. The concept is simple – human history has been driven by a particular kind of high-achieving ‘alpha-male’ – a vicious sociopath whose most notable trait is the utter inability to believe they are, or can ever have been, wrong. When challenged, they invariably fly into rage & blame everybody but themselves for all flaws. Thanks for commenting Cat. While I don’t think Wilson and van Vogt’s theory tells the whole story, I do think there’s a lot in it. Thankfully there are counter-balances to the vicious sociopathy you mention. It’s just unfortunate that modern civilisation has devalued those counter-balances to the point where they have very little effect. Doesn’t mean the balance can’t be redressed. Just that it’ll take a lot of time and effort.